Because the actual election promises to be the beginning of the End Of Days, it might be safer—and more fun—to just play a video game about it instead. 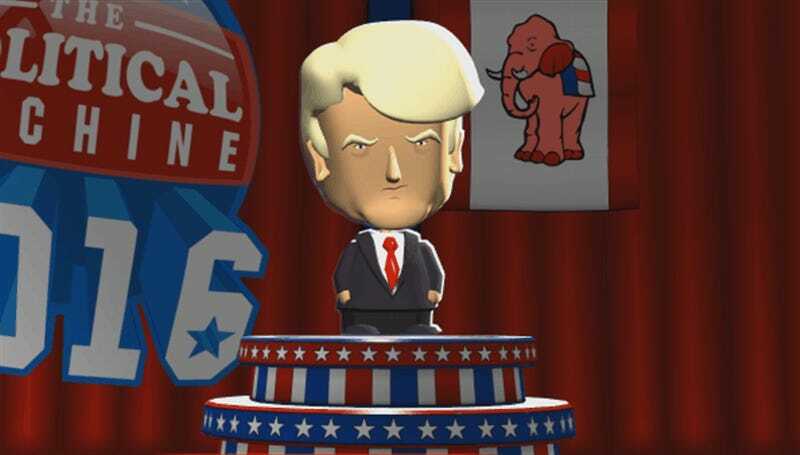 The Political Machine 2016 is the latest in Stardock’s series of not-serious-at-all election simulators for the PC, whose previous games have been relased in 2004, 2008 and 2012 to coincide with other, actual Presidential tilts. Players have to pick a candidate—and yes, these are real candidates, so you can be Trump, Clinton or Sanders (or historical runners like Al Gore)—and then manage their entire campaign, from what they wear to what they say to their policies to how their finances are run. It works much like previous titles, in that it’s essentially a board game, with rivals taking turns to move between states and choosing from a series of actions, like fundraising or giving speeches, while managing your finances and stamina. So the only real changes here are the list of candidates and the issues you tackle. For those who have never played, though, it’s simple, but also effective design; this isn’t the kind of game to appeal to grognards and economy buffs who want to dig deep, it’s a nice casual experience that anyone who wants to have a laugh at the US electoral system (by engaging in a decent simulation of it) can enjoy. The game’s in Early Access on Steam for $10.